For Hyperhidrosis Awareness Month this year, I had the amazing opportunity to share my story of living with Hh on a larger scale. The International Hyperhidrosis Society approached me earlier this year to ask if I would consider being a part of their Awareness Month campaign and tell my #HhStory. Although I am usually pretty secret about my condition, I decided to take the leap and trust that a video like this could help others living with Hh and spread awareness and understanding. It’s always important to me to portray Hh as NOT just a little sweat. The video really captures the struggles I’ve faced and the obstacles I’ve had to overcome to get through each and every day. My story is just one of many from millions of other Hh sufferers all over the world. You are not alone. We are in this together. So, without further ado, here’s my story. So, I guess my secret isn’t so secret anymore…and that’s okay. Thank you to the International Hyperhidrosis Society for this opportunity and to my husband and mom who joined me to share their experiences of having someone with Hh in their lives. I live with Hyperhidrosis in a private way. It is my secret life. My palmar and plantar Hyperhidrosis can be invisible to others. I’ve also become so good at hiding it that there’s a chance that the people I interact with on a daily basis might never even know I have this condition. I have lived with Hyperhidrosis for 31 years. I am used to this life. But sometimes it doesn’t seem to get any easier. As I sit and write this, I am fanning my hands and soaking the sweat up with paper towels. I am trying to breathe through my discomfort. I am alone in my room, not anxious or nervous about anything, and I’m still struggling just being me. One of my most successful coping techniques for Hyperhidrosis has been writing about my experiences on this blog. It has helped tremendously getting my thoughts and frustrations out about living with this condition. Another way I cope with Hyperhidrosis, is to tell people in my life about it. November is Hyperhidrosis Awareness month. It is our second annual month and I am so thankful that this condition has reached the point to have an official month. It is a very big accomplishment in the world of Hyperhidrosis and it’s an exciting time to be a part of it. I encourage us all living with Hyperhidrosis to get out there and tell someone about this condition and what it means to have it. Not only will telling someone about Hyperhidrosis spread awareness and understanding, it could give you the relief and support you need. For me, telling certain people about my Hyperhidrosis has made my quality of life better. One really impactful example I have for you happened just last week. For some backstory, a few years ago, I decided to start mentioning my Hyperhidrosis in my job interviews. I was at the point in my life when I was starting to switch careers and go into Special Education. Hyperhidrosis was my biggest inspiration for my decision, and as scary as it was to talk about, I found it fitting to explain why my life experience has led me to this point. So, my current boss has known about my Hyperhidrosis since the first day I met her. Since starting this job a year and a half ago, little by little, I explained what living with this condition means to me. I’m thankful I told her about my condition right away because it allowed me to be myself. I work from home now, which has been a huge help in managing my own room temperature and always having a fan at the ready. But this fall, I have been traveling to the office more frequently. Last week while I was in the office, I was part of a group meeting. The room was very warm and I knew immediately that I was going to have an issue with my hands sweating. I had a paper towel with me, but I was worried it was not going to be enough. At any other job, I would have just dealt with it and melted away, not being able to focus on the meeting at all. I’ve had those meetings where all I could concentrate on was my sweat and how uncomfortable I was – and how nervous I was for my secret to be discovered. My boss was part of this meeting and I asked if I could bring a fan in to help with my Hyperhidrosis. She didn’t question or give it a second thought. I brought the fan in and positioned it at my hands. I don’t think that anyone else in the meeting thought it was weird or different. It may seem small, but this fan helped my hands stop sweating and allowed me to focus on the meeting. It made me feel normal. It’s funny how something so small like this can be so impactful to me. I think of it and smile even now. One person who knew about my Hyperhidrosis made me feel comfortable enough to bring in an accommodation for myself – something I knew would help me. Telling people about my Hyperhidrosis has made my life better. That is just one example of how Hyperhidrosis awareness has helped me personally. I believe that Hyperhidrosis awareness and understanding will make the world a better place for us. We are all in this together. This month, I encourage you to tell someone about your Hyperhidrosis journey. Be strong and have courage. I know you can do it. I can’t wait to hear your stories! My wedding day – April 16, 2016. It was the best day of my life, but Hyperhidrosis almost made it a disaster. Everything was in place. Our timeline was set and our vows were written. Our friends and family were gathered. We were ready to celebrate the start of our lives as husband and wife. Wait. Open toe shoes!? What was I thinking? If you’ve read some of my previous entries, you may remember that I gave up open toe shoes awhile ago. My feet would sweat, then my shoes wouldn’t fit properly, and I would risk slipping out of them. How did I forget all about this during my wedding planning? I thought they were the perfect shoe and my mind was set. In preparation for our big day, I was all up to date on my iontophoresis treatments for my hands. My hands were doing great and I had the extra benefit of the colder weather to stunt my excessive palmar sweating. But I didn’t do anything for my feet. I just didn’t think through what could happen. Thankfully, I had no issues for our outdoor ceremony. It was in the middle of chilly April in upstate NY. We made it through our emotional first look and our beautiful ceremony, tears and all. Afterwards, at our indoor reception, we went immediately into our first dance which we choreographed ourselves. It was flawless. My body temperature was still on the cooler side from being outdoors, so I didn’t have issues with sweat when we were dancing. But as soon as we finished, that’s when my body temperature caught up with me. My feet started to sweat. This could be a problem. And so throughout dinner, I had my feet under the table resting on paper towels. Thankfully, there was a long tablecloth that hid my feet from the guests. It was pretty embarrassing though, and very upsetting for me. Would I be stuck at my table the whole night? I shouldn’t have to deal with HH on my wedding day. Right after dinner was our father/daughter dance. I went up to my Dad right before and told him that I could barely walk in my shoes and to be very gentle when dancing and twirling. We made it through beautifully, but I was so nervous. My feet barely left the ground as I slid around the floor. I’m thankful that my Dad understood the situation and he didn’t make a big deal out of it. I was really worried about being able to enjoy the rest of our reception. I could barely walk in my shoes, let alone dance. I could never go barefoot as that would be even more dangerous and slippery. I felt like I was going to be stuck at my table all night with my feet on paper towels. What a brilliant idea! I had a long enough dress that would cover my shoes, so no one would really see a paper towel sticking out of the open toe. I put the paper towels in my shoes and it was the best thing I did. It allowed the sweat to soak up and I wasn’t slipping out of my shoes anymore. I was able to enjoy the rest of our reception and dance the night away! I am happy that I remember our wedding day as the perfect day. I am thankful for my sister’s help in remedying my situation and making sure I had a good time. Although I’ll never forget this sweaty memory, there are happier memories that come to mind when I think of that day – marrying my soul mate and sharing the day with everyone we love. We will always have our perfect day. A lot can happen in 2 ½ years. Told my HH story at the Patient-Focused Drug Development meeting (PFDD) on hyperhidrosis hosted by the International Hyperhidrosis Society in Washington D.C.
It’s been a pretty busy couple of years for sure. Having a full time job, part time school, and part time music and teaching has kept me involved, but I am happier than ever. I feel lucky to have so many opportunities to combine both my passions for music and for helping people. A lot has happened, but Hyperhidrosis has always been my constant. I’ve been on and off of iontophoresis treatments (currently off). Summer is coming to an end and I’m looking forward to cooler weather to dry me up a bit. I have had many issues with HH this year and still consistently feel uncomfortable in my skin. The other day when I was in NYC for work and traveling in the hot subway system, I had a thought that kind of made me feel better. At least it made me laugh. I’m definitely a perfectionist and enjoy when I do things well. So, I thought about HH in a positive way. Maybe I can tell people that I’m just really great at sweating. I exceed the average person at it for sure. I started a draft of this entry last week because of my increasing longing for getting back into the HH community. Little did I know, my SELF article was circulated on SnapChat last weekend. I don’t use SnapChat, so I wouldn’t have known if it wasn’t for my cousin who sent me a screenshot. This was very exciting and couldn’t have been better timing. It truly is time for me to start connecting with you all again and I am so sorry for my hiatus while I focused on school. I will finally graduate this December after four years of pursuing my degree in Special Education. Thank you to everyone who sent me emails after seeing my article on SnapChat this week. I am so grateful that you reached out to share a little of your HH story with me. Over the next few entries, I plan to elaborate on everything that’s been going on with me for the past 2 ½ years. For now, I just want to say hello again and I look forward to sharing our stories together. Is everyone gearing up for Hyperhidrosis Awareness month this November? I’d love to hear about your ideas to spread awareness. Together, we can make change. I was recently introduced to a brand new product called Carpe. It is an antiperspirant hand lotion for sweaty hands! I received a sample of this product in the mail a few weeks ago and immediately felt results. I was recommending this product the day I tried it and I am happy to write a review for my blog! What’s great about this product is that it is a non-invasive solution for sweaty hands. It’s something you can take on the go and use as you need it. It can be used daily and will keep your hands sweat-free for hours (4+). Carpe is an opaque white lotion with a pleasant scent. It smells like eucalyptus and mint. One of my first observations when opening the lotion was that it had a mild scent and didn’t smell like medicine. I feel like a lot of similar lotions don’t have as nice of smell. 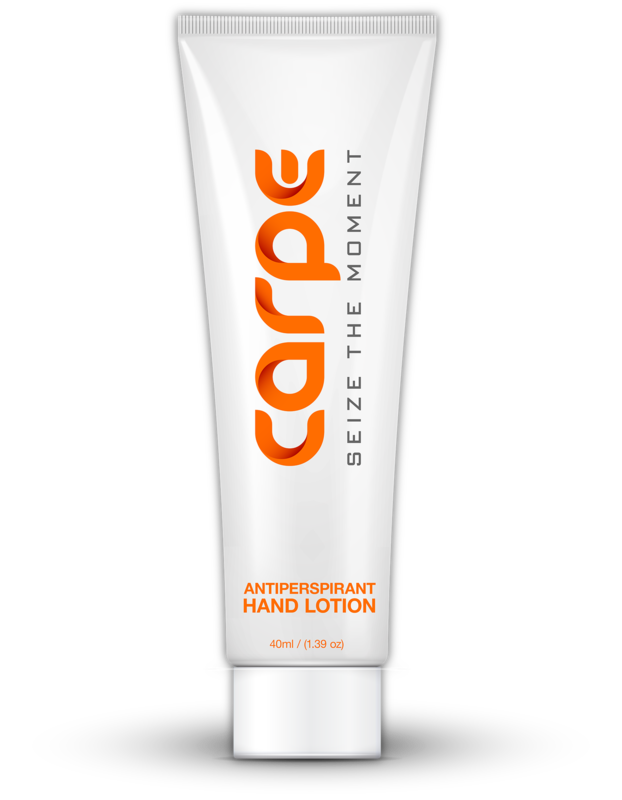 Carpe should be applied to clean and dry hands. You apply a pea-sized amount to your palms and rub together for 15 seconds. The lotion is pretty tacky when going on, but it disappears within the 15 seconds and leaves no residue. I was able to resume typing on my computer keyboard after the 15 seconds and did not need to rinse my hands. The lotion sunk in for a while and my hands were dry. I find this product especially good for people with HH who have not yet explored other treatment options, children with HH, and people who have occasionally sweaty hands. For people who haven’t explored any other treatment options, a lotion is the perfect way to start. Carpe is sold over the counter and is very affordable. One tube costs $14.95 and will last for 1.5 months. For children with HH, I think a lotion is absolutely the way to go. Since HH is hereditary, I’ve given a lot of thought to how I will approach HH with my future children if they get my HH gene. I would not want to put them through Iontophoresis or give them Robinol until much later. Since the lotion is topical and can be reapplied throughout the day, it’s a great tool for kids at school and during after-school activities. Same goes for people who do not have HH, but have occasionally sweaty hands. The lotion is great for them because they won’t need the more intense treatments like Ionotphoresis or Robinol. Last week, I had the pleasure of speaking with the co-creater of Carpe, David Spratte. He started working on this product when he was a senior in high school because of his frustration with sweaty hands. Now, a junior at the University of North Carolina, his product is on sale and ready to help the HH community and more! I was quite impressed to learn how much David had accomplished at such a young age and I was inspired by his story. I love that this product was created by someone who was struggling with sweaty hands himself. He took his experiences and knowledge of sweaty hands to create a product he knew would work. David uses Carpe every day. Something unique and special about Carpe is that long-term sweat reduction is possible if it is used regularly. David says that based on efficacy studies, 60% sweat reduction is achieved long-term if used once a day. Carpe is FDA-certified and non-irritating, so it is safe to use daily. Additionally, I was very happy to learn from David that Carpe also works on sweaty feet and foreheads. If you use the product on your feet, wait 10-15 minutes before putting on a shoe or sock to ensure the lotion sinks in. Last, I would like to mention how much I love the name of this product. Carpe is short for Carpe Diem – Sieze the Day. David uses ‘Sieze the Moment’ on his packaging. Having this association with the lotion completely correlates to what I mention in my blog: Don’t let HH limit you and what you want to do in life. This lotion can provide much needed relief as you face challenging and potentially embarrassing daily situations. Whether it be a handshake or highfive, playing sports or musical instruments, or simply taking a test with paper and pencil, Carpe can be a solution for you. Please let me know if you have any questions about Carpe and please check out their website!